After graduating from the University of California at Berkeley with a Bachelor of Arts degree and working his first job at a biotechnology company, Allan switched gears and signed with prestigious Ford Model before he was invited to become a VJ (video jockey) for MTV Music Television in Taiwan, where he helmed programmes such as Party Zone, MTV International Top 20, and Most Wanted. Allan then moved to Singapore and ignited his career as the host of Talentime 2001 and Ford Models Supermodel of the World. His television credits include lead roles in English serials such as Love Matters and My In-Laws as well as Chinese serial drama productions including Bukit Ho Swee, Beautiful Connection, The Unbeatables III, True Heroes, Child’s Hope I and II, My Lucky Charm, Shui Jia Mu Ji Bu Sheng Dan and Xing Jing Er Ren Zhu. Allan has also hit the big screens with movies such as Raintree Production’s romantic comedy, I Do I Do, and Night Corridor, a Hong Kong production produced by the acclaimed Stanley Kwan. Other films include the China production Kung Fu Hip Hop and Love Cuts in Singapore. In 2015, Allan showed the other side of his life of what it takes to be a father on reality show Men in Kindergarten. 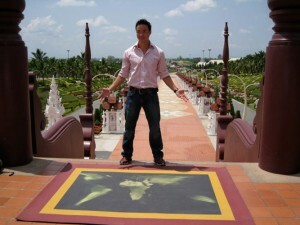 As Singapore’s bonafide hunk and action hero, Allan flew back to the United States to compete on Fear Factor. With an endless appetite for action and adventure, Allan landed the coveted spot as the host all five seasons of The Amazing Race Asia, based on the Emmy award-winning US reality show. The hugely popular program was telecasted throughout Asia, and the show saw a never before record viewership, and is still the highest rated reality series in Asia. Allan also made a guest appearance in the popular Hong Kong variety, Super Trio Supreme Singapore version where Allan led the Singapore contingency to beat the opposing celebrity team! Allan brought all the unbelievable quirks and incredible stories from around the world to your living room on Ripley’s Believe It or Not. Not one to be complacent and rest on his laurels, Allan continually pushes his limits and tests his abilities with new challenges and projects. One adventure was moving to China where he hosted the 2011 Miss Universe China beauty pageant and two more versions of The Amazing Race China Rush on ICS/Dragon TV and The Amazing Race China Celebrity Edition on Shenzhen TV, the latter has become the second highest programme in the China market. Several other adventures included being a travel host for Channel U’s Somewhere Out There and Unique Towns as he travelled to remote destinations uncovering hidden stories and testing human resilience. Despite being a motorcycle buff, Allan joined his celebrity friends in Celebrity Car Wars Asia as a celebrity contestant to enter a series of entertaining driving challenges brought to TV screens on HISTORY Asia. Back in Singapore and raring to go, Allan is all set to take teams across Asia in the long awaited return of The Amazing Race Asia Season 5 on AXN. Allan Wu is proudly represented by FLY Entertainment.